Green superfood powders can be an excellent addition to your diet. These powders can offer nutrition that may sometimes be difficult to get from regular food. Below we'll go over some benefits and ingredients to look for along with a few good recommendations. While there are many supplements on the market today, green superfood powder is arguably the most popular. One reason is due to the sheer number of benefits green superfoods can provide. This blend of vegetables and fruits can be an important supply of vitamins, minerals, antioxidants and more. If you’re looking for a way to boost your health and energy levels, green superfood powders can be a great solution. Our complete guide explains what superfood consists of and what benefits it can provide. We’ve also included mini-reviews for five of the most popular green superfood powders, including our top recommendations. Green supplements have been popular since the mid-2000s. While the benefits of greens are substantial, some of the initial marketing was a bit out of hand. Green superfood powders aren’t an instant cure-all for every disease or ailment. Instead, green superfood powders promote long-term health and energy. They’re an easy source of natural benefits. Green powders are packed with vitamins and minerals. They usually also include a variety of antioxidants, probiotics, digestive enzymes and more. The vast majority of superfood powders consist entirely of natural foods. No artificial ingredients are included. Typically, superfoods will also be 100% organic, vegan and free from GMO’s. Ingredients will vary by brand. Most powders will start with a base of wheat grass, barley grass, spirulina and chlorella. Beyond algae and grass, the next group of ingredients will include fruits and vegetables. Also included will likely be some combination of mushrooms, roots, leaves, fibers and similar. Probiotic bacteria and digestive enzymes are commonly added as well. •	Antioxidants – Reduces the risk of cancer and cellular damage. •	Probiotics – Bacteria which reduces body inflammation. •	Digestive Enzymes – Improves nutrient absorption. Helps reduce symptoms of IBS and Crohn’s disease. •	Adaptogens – Stress-reducing compounds. Also, green superfood powder can help boost your energy levels. Perfect for starting the day off right with a boost of natural energy. Also works well as a post-workout recovery drink. While you could conceivably get all these benefits through fruits, vegetables and vitamins, many people prefer the simple ease of Superfood powders. Daily use can act as a substitute for multivitamins, antioxidant supplements, digestive health supplements, Rhodiola rose, milk thistle and more. Regular use of a superfood powder can have tremendous health benefits. However, when selecting a green Superfood powder, be aware of any brand which makes “too good to be true” claims of its effectiveness. How are Superfood Powders Used? The powder is typically mixed into a glass of water. Almost all superfood powders will contain a plastic scoop. Simply drop the scoop into a glass, add water and you’re good-to-go. You can also add the mixture into a smoothie. The taste will vary based on the strength and flavor of a smoothie. For best results, you’ll want to use a blender. If you’re not used to alkalized ingredients like vegetables and fruits, the superfood drink will probably taste a little weird at first. This is because your taste buds aren’t familiar with the ingredients. You’ll likely find the drink to taste a bit plant-like and earthy. Over time, your body will adapt. Usually, after about a week or two, the drink will taste much more pleasant. 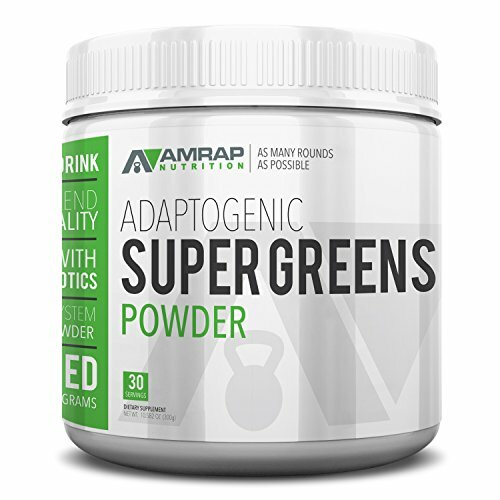 Named for performance-focused exercise, AMRAP’s supergreen powder is specifically designed for athletes looking to improve their performance. The micronized powder blends 11 green juices including wheatgrass, chlorella and spirulina. The mixture is flash-dried to retain maximum nutrients. The alkalizing formula contains no gluten, fillers, artificial flavors or genetically modified ingredients. Helps your body remove toxins. Also provides an energy boost for quicker workout recovery. Each batch is thoroughly tested by an independent lab. All production facilities are regulated by the FDA and Good Manufacturing Process Certified (cGMP). Plus, 10% of the profits are donated to global children’s charities. While superfoods are great for your health, they’re not always pleasing for your taste buds. Peak Performance emphasizes how their greens are for people who normally don’t like the taste of superfood powder. Combining over 25 fruits and vegetables, the powder contains barley grass, wheat grass, kale, spinach and more. All ingredients are organic, vegan and paleo. Contains no sweeteners, refined sugars, pesticides or hormones. While many superfoods target only athletes, Peak Performance tries to appeal towards regular people, too. This blend is designed to boost both mental and physical energy. Moms, busy businesspeople and others with active lifestyles can drink the powder to help achieve peak performance each day. Nested Naturals is a friendly, health conscious company which seems to take a lot of pride in their Superfood Powder. Their products are designed for anyone confused about the world of superfoods. Their Super Greens powder contains a blend of over 40 ingredients. Barley grass, wheat grass, spinach. Broccoli and other alkalizing ingredients. Over 20 of the ingredients are organic. Nutrients can easily be extracted thanks to the addition of bromelain and other dairy-free probiotics. These enzymes help your body absorb more of the superfood benefits, and aren’t found in many other blends. Each batch will have a slightly different look and taste. Nested Naturals avoids lab-grown ingredients. So greens are always sourced fresh, which means no two jars will be exactly alike. 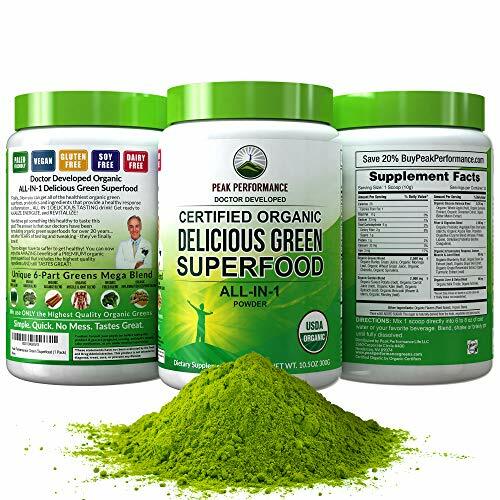 Our recommendation for the best green superfood powder is the AMRAP Nutrition Organic Supergreens Powder. We like the high-quality ingredients, mixability and energy boost. Other green powders on the list have a lot to like. 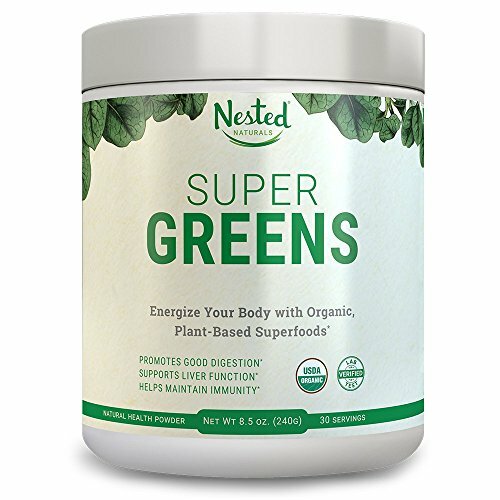 The Nested Naturals Super Greens #1 Green Veggie Superfood Powder has over 40 fruits, vegetables and other alkalizing ingredients. If you want a wide range of nutrients in your powder, this is an excellent choice. If taste is a main concern, check out the Peak Performance Organic Greens Superfood Powder. With a light, pleasant taste, this powder works great for people who don’t like the typical taste of green superfood powder. However, the AMRAP Nutrition Organic Supergreens Powder is the powder we think is the best choice for most people. The 11 alkalizing ingredients are combined in a cGMP lab under strict quality control guidelines. Plus, the flash drying keeps the mixture fresh without a loss of nutrients. This formula also provides an effective energy boost, making it perfect for athletes and busy professionals. But it’s also a healthy choice for everyone else, too. Works great for anyone who doesn’t want to eat a lot of fruits and vegetables. If the taste is too “green,” this powder can easily be mixed into a smoothie. Green superfood powders are an easy way to boost your health, increase your energy levels.